On Monday, August 13, the Sotpattana School for the Deaf in Pattaya celebrated their 30th anniversary with a great feast dignifying the work and dedication which has and still is done to benefit less fortunate children. The Sotpattana School for the Deaf, located on the compound of the Pattaya Orphanage, was officially set up in 1982 by Rev. Fr. Raymond A. Brennan, the well known noble Redemptorist priest who had also co-founded and managed the Pattaya Orphanage. It is administered by Diocese of Chantaburi. The school approaches an issue of great importance: The promotion of deaf children. If neglected, those children would suffer an unhappy life and cause problems to society. The school provides them with educational opportunities to help them in their communication with others and prepare them for higher communication, thus also alleviating the burden of the children’s parents. 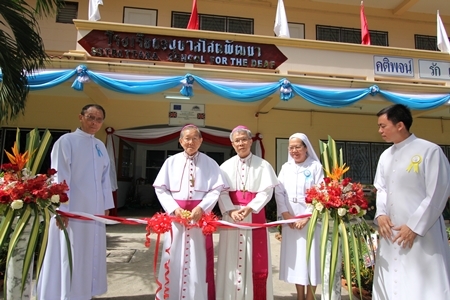 (L to R) Father Dr. Veera Phangrak, director of Pattaya Orphanage; Bishop Emeritus Thienchai Samanjit, former Chantaburi Diocese; Bishop Philip Banchong Chaiyara, Diocese of Ubon Ratchathani; Sister Suphtra Nonthasuwan, female rector and assistant director to Human Resources of Pattaya Orphanage; and Father Kritsada Sukkaphat, deputy director of Pattaya Orphanage cut the ribbon to officially launch the event. To commemorate the 30th anniversary of this institution a great party was set up to celebrate appropriately, solemnly just as well as hilariously. The celebration began in the morning when the guests of honor arrived. Most notably, the celebration was attended by Bishop Lawrence Thienchai Samanjit, Bishop Philip Banchong Chaiyara, Mr. and Mrs. Richard Smith representing PCEC, Praichit Jetpai, president of YWCA-Bangkok-Pattaya and Sopin Thappajug, MD of the Diana Group. Further, all principals of the Sotpattana School also joined the event. Father Veera Phangrak (left), director of the Pattaya Orphanage, along with children and care givers greet Bishop Emeritus Thienchai Samanjit (right). An exhibition showed the numerous guests, families and friends of the students as well as benefactors, about the daily life at the Sotpattana School. Later on, a biblical service was held and awards presented to past and current school administrators and dedicated teachers as well as to supporters. After this formal celebration the fun part began: Kids of the Sotpattana School and the Pattaya orphanage entertained the guests with great stage shows and what is more, everybody was invited to join a shared luncheon featuring traditional Thai food. Truly, the 30th anniversary of the Sotpattana School was an occasion to do both, commemorate and revere the dedication and admirable work of the people standing behind the school as well as enjoy and feast a cheerful party. 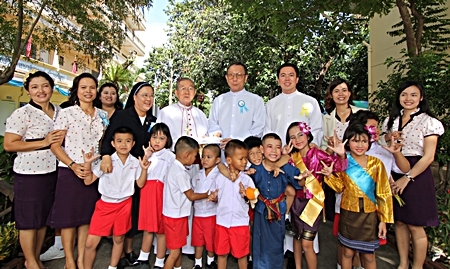 Children and care givers pose for a commemorative photo with Bishop Emeritus Thienchai Samanjit (center), along with Father Veera Phangrak and Father Kritsada Sukkaphat. Finally, it should be mentioned that there is going to be another great event at the occasion of the 30th anniversary. On October 6, a charity musical show will take place at the Thai Alangkarn Theater featuring dancing shows by orphans and deaf children, but also the famous Extravaganza show by Thai Alangkarn Theater. All proceeds go to the “Education Fund” for orphaned and deaf children. Tickets are available in two categories, for prices of 500 and 1000 baht. Supporters are also greatly welcome to sponsor tickets for unfortunate children who thus are given the opportunity to enjoy an amazing show that is, for them in particular, a unique evening. For more information and to buy tickets, please contact the Human Help Network Foundation Thailand, [email protected] or call 038-488-956 (or 038-416-426). Children at the school certainly enjoy the attention. Father Veera Phangrak adds some warmth and humor to the anniversary proceedings. 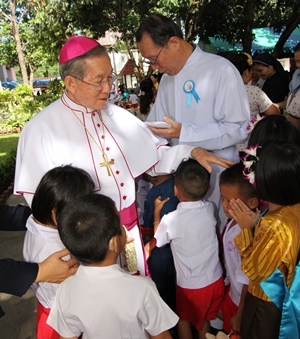 Bishop Emeritus Thienchai Samanjit spreads his loving care amongst the children.